Light weight.A pair clip-on earring featuring a sqaure cz sorrounded with diamante. Best Gift for Every Occasion; Wedding,Party,Gift,Birthday,Anniversary,Christmas,Mother's Day,Prom,Valentines.suitable for Mother,Grandmother,Daughter,Wife,Girlfriend, Sister, Aunt, Mom. If you have any questions about this product by FC JORY, contact us by completing and submitting the form below. If you are looking for a specif part number, please include it with your message. Mariell CZ Clip-On Earrings with Pear Dangles. 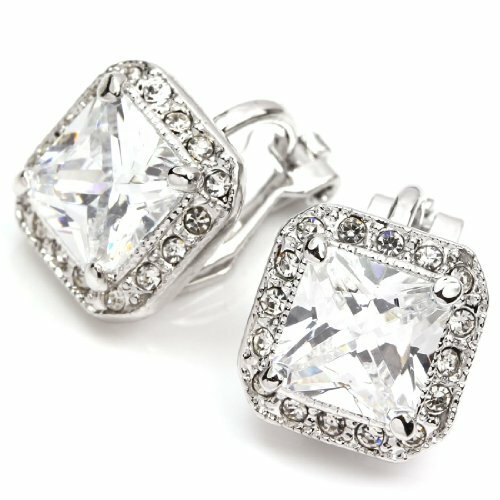 Drop Style Silver Bridal Clip Earrings for Weddings!